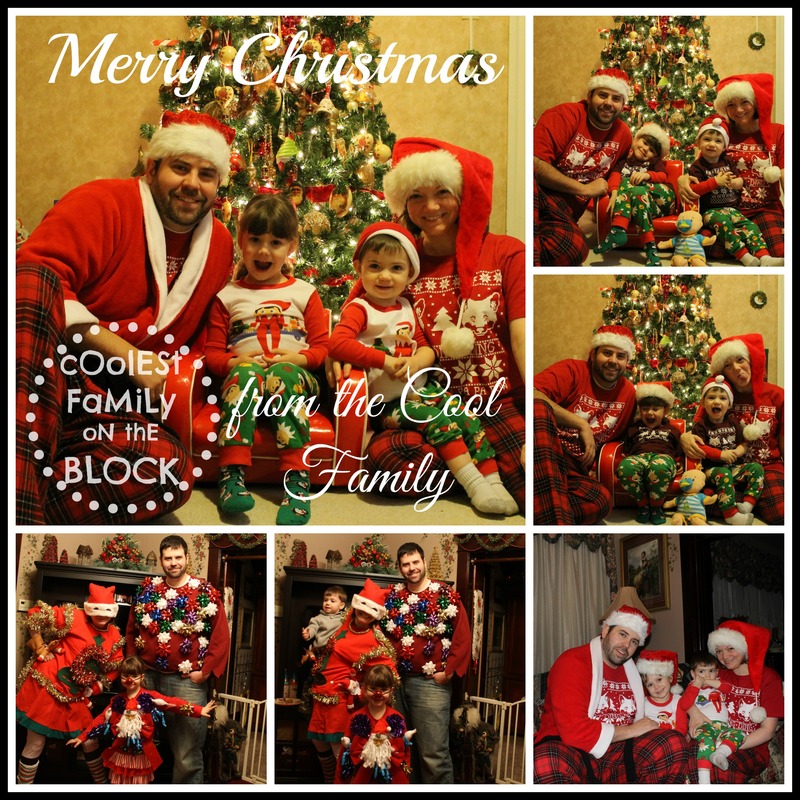 Merry Christmas from The Cool Family! Santa came to visit us and left his dirty, sooty boot prints everywhere again! And we were lucky enough to catch another photo of Santa in our home! Our gift wrapped doorway was a bit anti-climactic this year. Our dog, Muppet, ended up pushing through first and loosening one of the sides, so the kids just sort of pushed the paper aside and walked under it like a curtain. Oh well. Opening up gifts and playing with new toys! 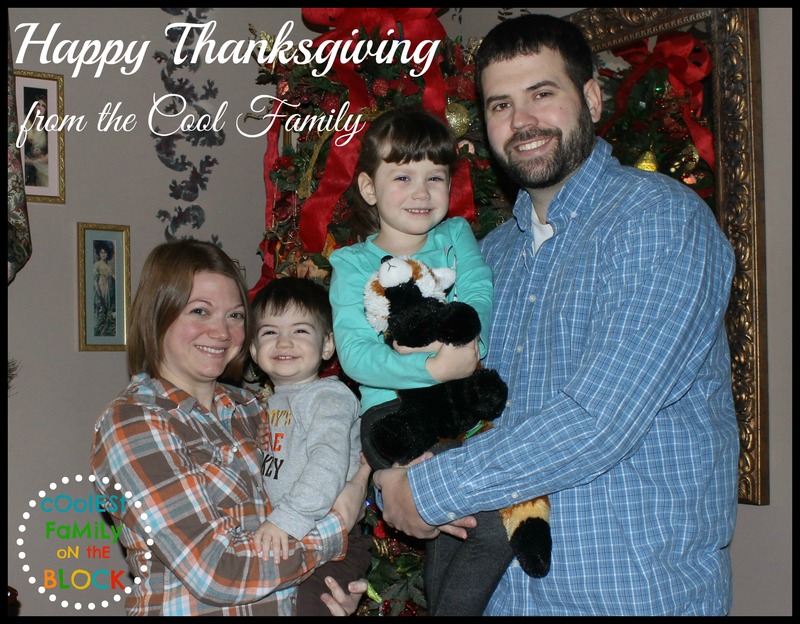 Oh, and hey, Happy Thanksgiving, because I apparently forgot to publish my post last month. Oops. Tis the season for Ugly Christmas Sweaters! 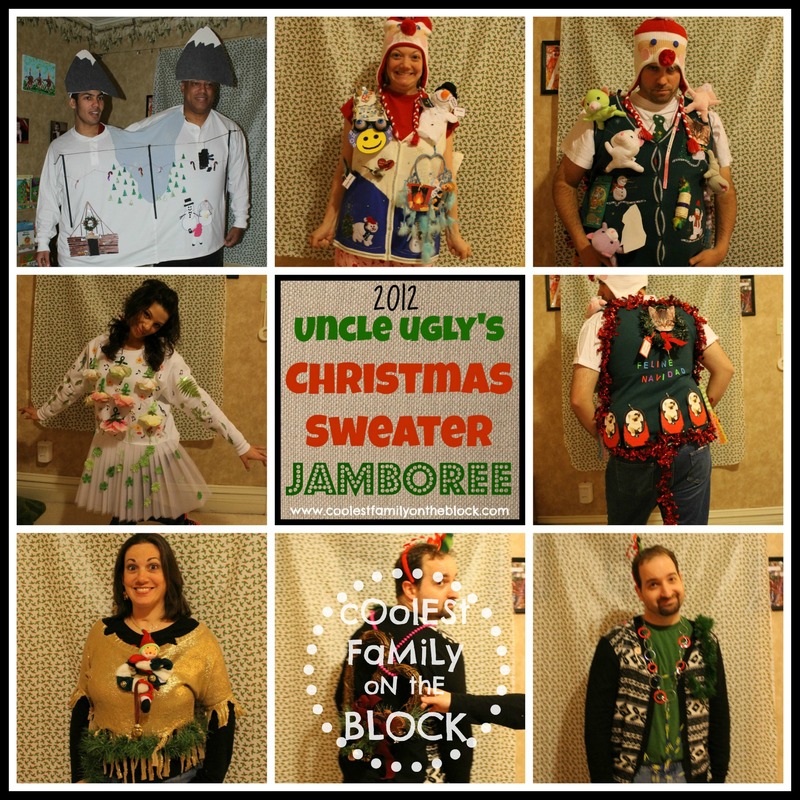 In 2010 our family started a new Christmas Eve Tradition: Uncle Ugly’s Christmas Sweater Jamboree (which is a longer way of saying “ugly sweater contest”)! These are the sweaters from 2012. Which one would you pick as the winner? 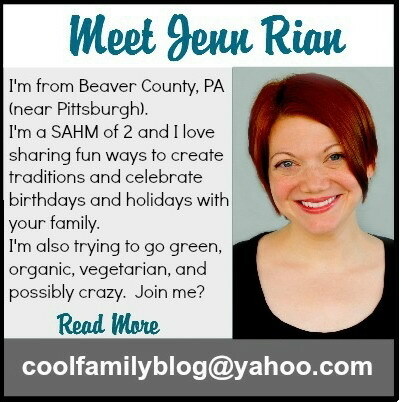 I always like to start things off with a photo of the one and only “Cool Family”. Jonathan was lucky enough to miss being in these photos because of his early bedtime. This year he may not be so lucky. First of all, settle down. I know that you are really excited about the awesome Santa hat that I’m wearing (and you should be), but this is sweater time. For my sweater I decided to represent the lyrics of the Christmas song “Winter Wonderland”. It looks odd and unChristmas-y from afar, but it is really a masterful work of creativity. So there. 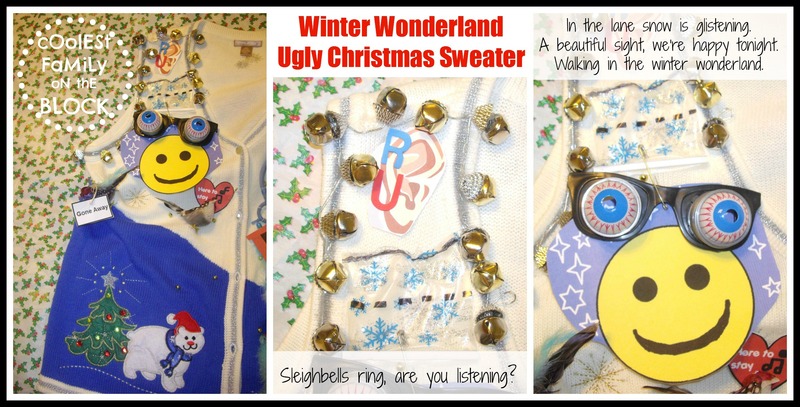 Sleigh bells ring…are you listening? In the land snow is glistening. A beautiful sight, we’re happy tonight. Walking in a Winter Wonderland. Gone away is the blue bird. Here to stay is a new bird. He sings a love song as he goes along. Walking in a Winter Wonderland. 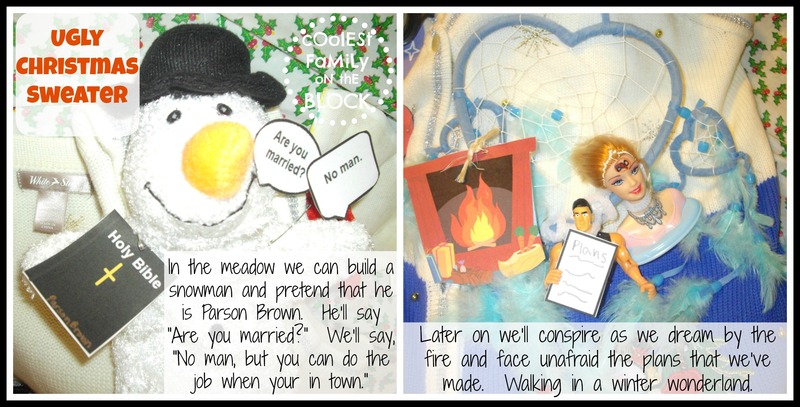 In the meadow we can build a snowman. And pretend that he is Parson Brown. Later on we’ll conspire. As we dream by the fire. And face unafraid, the plans that we made. Walking in a Winter Wonderland. 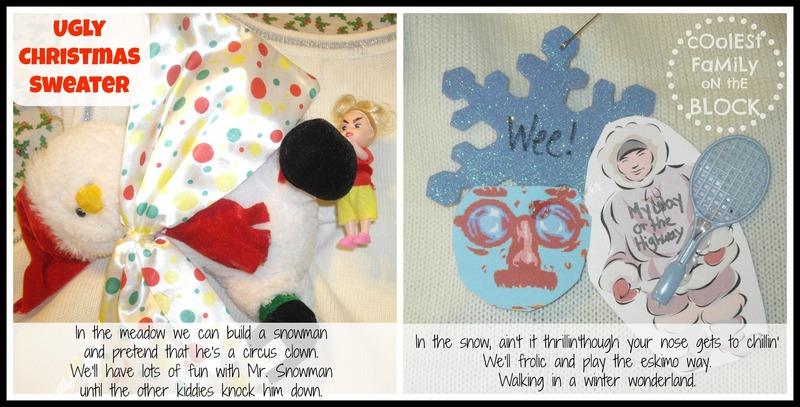 In the meadow we can build a snowman and pretend that he’s a circus clown. We’ll have lots of fun with Mr. Snowman until the other kiddies knock him down. In the snow, ain’t it thrillin’? Though your nose gets to chillin’. We’ll frolic and play the Eskimo way. Walking in a Winter Wonderland. 2012 Cool Daddy finally went with a theme other than “creepy uncle”. (Do you remember the mustache of 2010 or the underwear of 2011? Or were you lucky enough to have Will Smith drop by and “flashy thing” those memories away?). 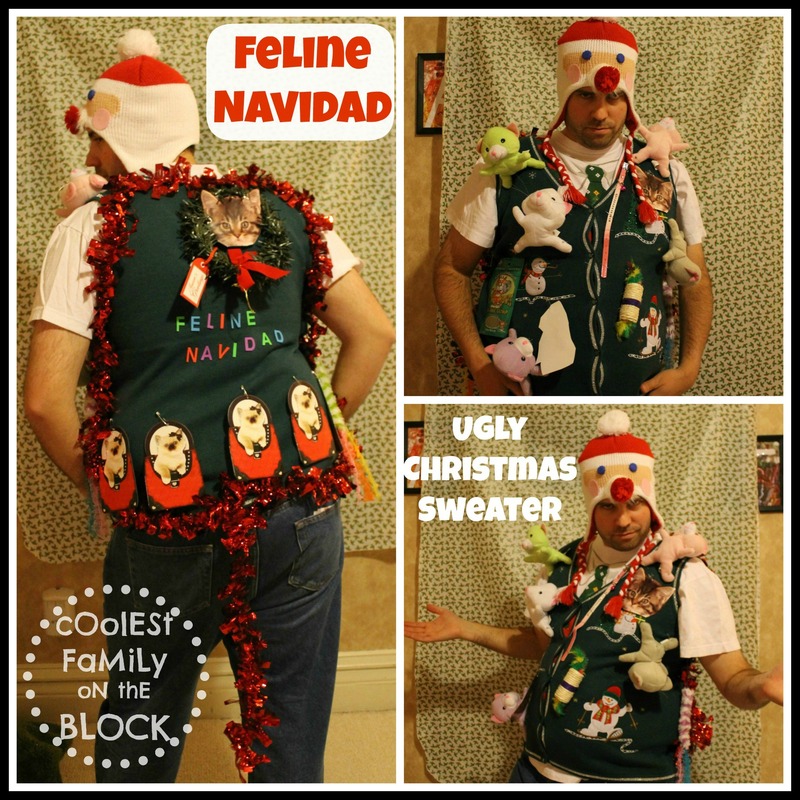 A Fancy Feast for the eyes, Cool Daddy’s wearable interpretation of “Feline Navidad” begins with a festive green sweater vest and ends with a cat tail made of red foil garland. Five stuffed cats of various colors are the focal point while the added details of cat toys, a pink cat collar with bell, and a package of cat nip bring this sweater to a whole new level. A year ahead of the times, the back features an en-wreathed cat head, rivaling Miley’s 2013 “Space Kitten”. For those not quick to recognize this brilliant theme, colorful foam letters spell out “Feline Navidad”. A row of kitten quints inside of red handbags hang playfully above the aforementioned shiny, red cat tail. This ugly sweater is the cat’s meow! My brother-in-law, Matt, is sporting a cardigan with a print that marries southwestern with ski resort. The back boasts a rustic heart shaped Christmas wreath complete with wooden gingerbread man, just like those worn by the southwestern ski bunnies of yesteryear. He accessorizes with a necklace/belt combination made from hoops and paperclips, while a mistletoe headband adds a touch of whimsy. My sister, Jess, is a maniac, maniac on the floor and in this Solid Gold inspired ugly sweater. Shining, shimmering, splendid, this sparkly gold sweater has fringed sleeves and mid-drift. Plain green garland gives a belt-esque look, while a be-belled stuffed Santa corsage prepares you to “jingle all the way” this season. After taking a year off to reflect upon his ugly sweater goals, U.A. 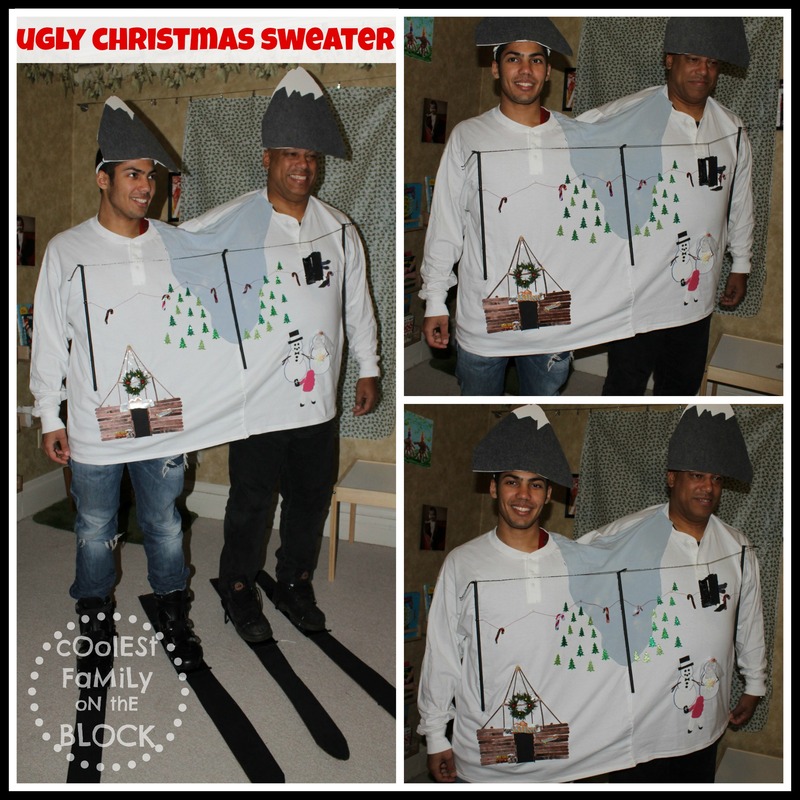 teamed up with his son, Ben, (2011 Ugly Christmas Sweater Champion) to bring us “The Two-Headed Ski Resort”! 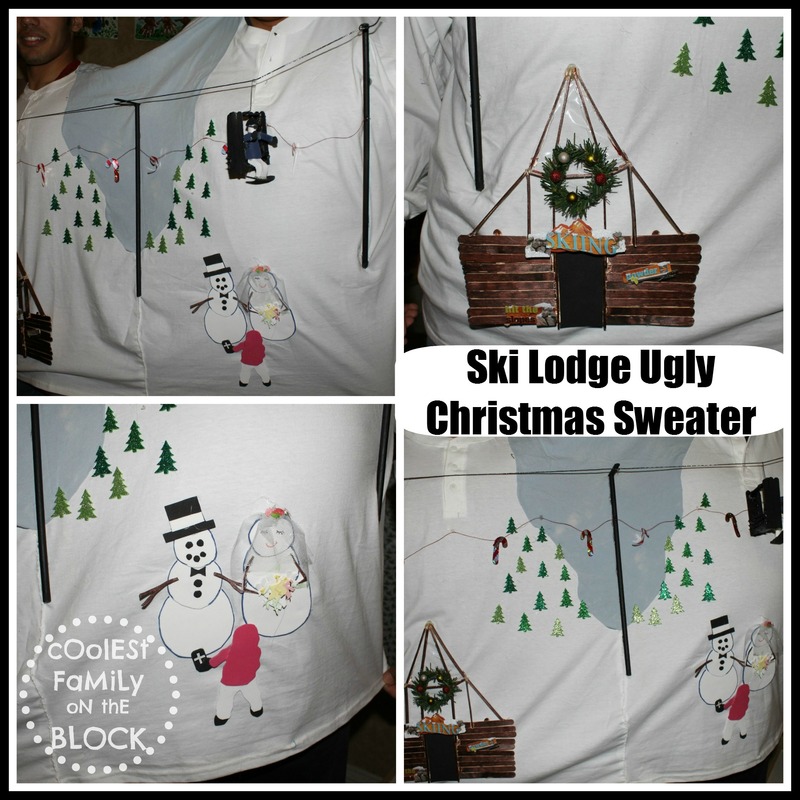 This Ugly Christmas Sweater has everything: a Popsicle stick ski lodge, a child performing a marriage ceremony between two snowpeople, sparkly green pine trees atop a snow-covered mountain, a ski lift with a tiny skier aboard, and two grown men wearing mountain hats. 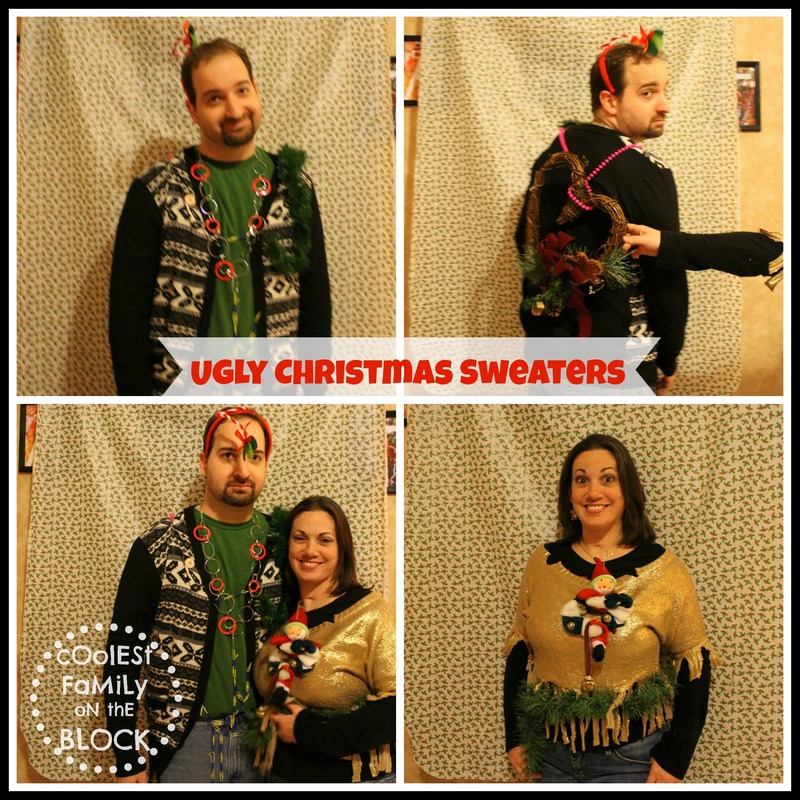 Last but not least, Aunia is once again confused by the concept of making an ugly sweater. 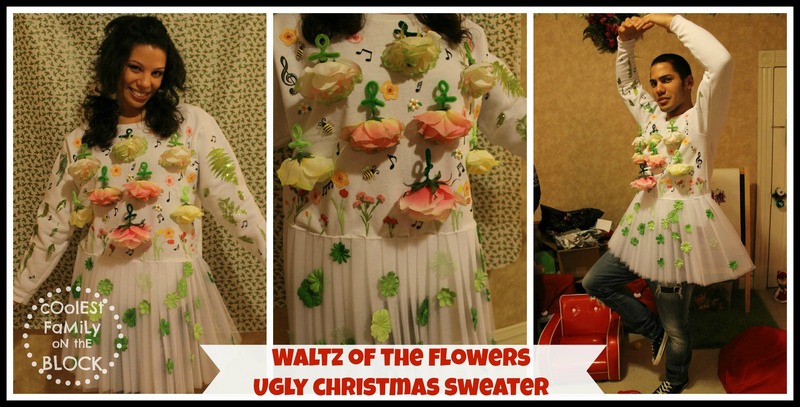 Complete with pleated skirt, her sweatery “rendition” of Waltz of the Flowers is a series of lovely flowers, charming bumblebees, and delicate musical notes. Who wore it better, Aunia (on the left), or her brother, Ben (on the right)? 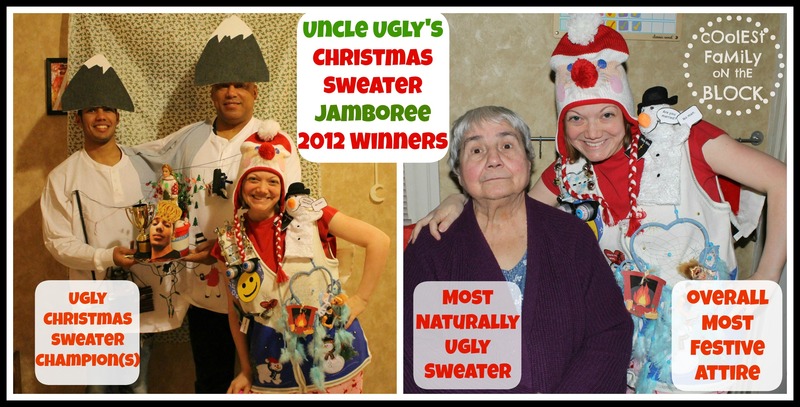 Those were the 2012 contestants of the Ugly Christmas Sweater Competition. 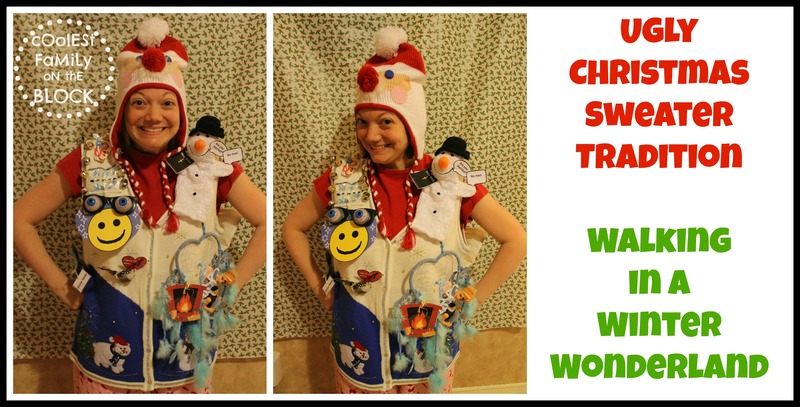 Before you scroll down to reveal the winner, who do you think deserves the Ugly Christmas Sweater Trophy of Awesomeness? The collaboration paid off! Father/son team Ben and U.A. 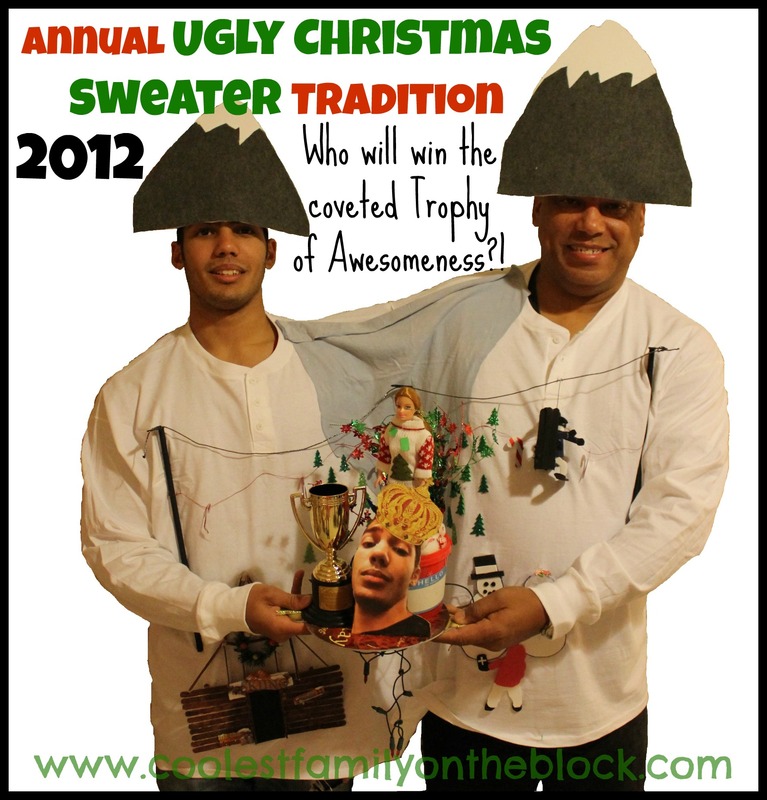 were named 2012 Ugly Christmas Sweater Champions, enabling Ben to hold on to the title for a second year in a row. I was given the title of “Overall Most Festive Attire”, and because everyone in the competition had altered their sweater and she was the only other person wearing a sweater, Grandma was given the title of “Most Naturally Ugly Sweater”. 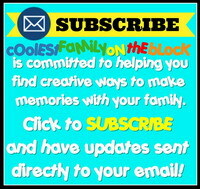 I can’t wait to see what kind of sweaters everyone creates this year! 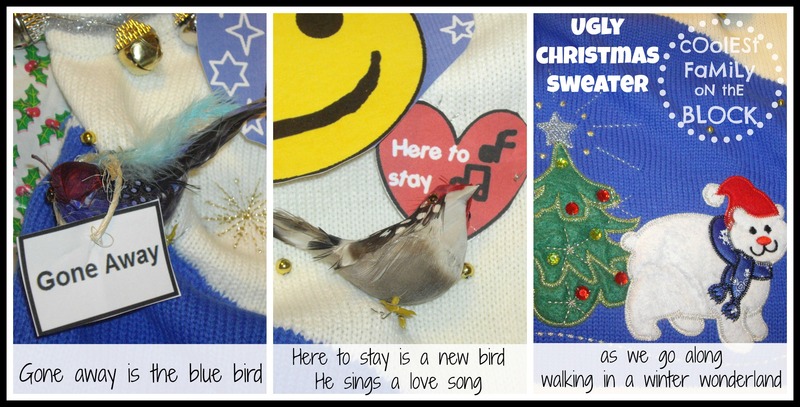 Which Ugly Christmas Sweater was your favorite? 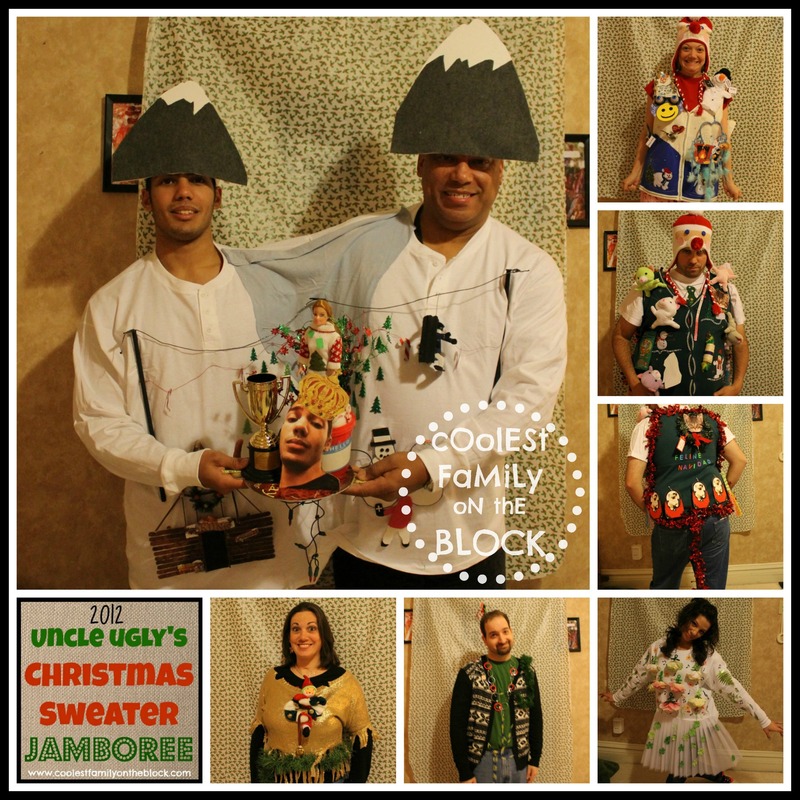 Does your family have an ugly sweater tradition? When Santa was here on Christmas Eve, not only did he leave presents for the children, and leave his messy boot prints all over our room…but he also gift wrapped the doorway! Now the Christmas tree and the presents were trapped behind a wall of wrapping paper. The only way to get to the gifts…was to bust through the wrapping paper! It was actually harder than it looks to bust through that paper! Because of the way our doorway is set up there were actually two layers of wrapping paper to get through. Perhaps at your house the bedroom doorway gets wrapped instead of the living room, or perhaps it’s tissue paper or streamers instead of wrapping paper. 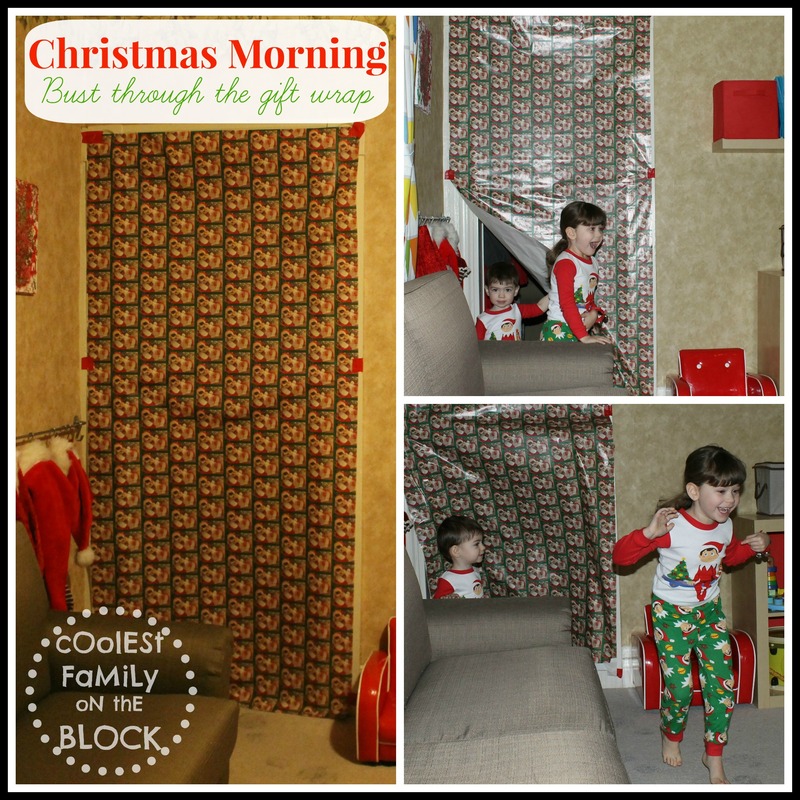 The great thing about the gift wrapped doorway tradition is that it can work for so many different families, whether Santa visits your house or not! It’s one that mom’s and dad’s can do themselves without Santa’s help. It’s one that teenagers can enjoy and look forward to as much as little children. Another Christmas morning tradition that we have in our family is the ceremonial knocking down of the Christmas blocks. Okay, it’s not ceremonial at all…but it is fun! In the photo below Jonathan was almost 11 months old and he crawled right to the blocks to knock them over. So far knocking down the blocks has been a fun little Christmas morning tradition, we’ll see if it remains fun as the kids get older! Does Santa gift wrap your door way? 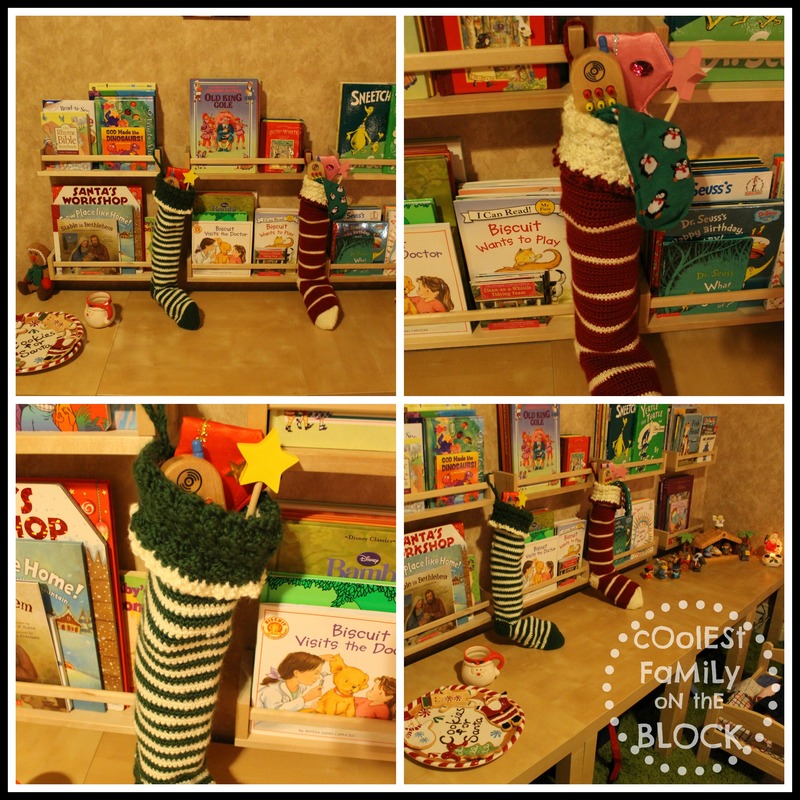 What are some of your fun Christmas morning traditions? Let me know in the comments!